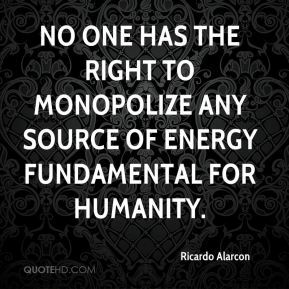 No one has the right to monopolize any source of energy fundamental for humanity. I am a possibilist. 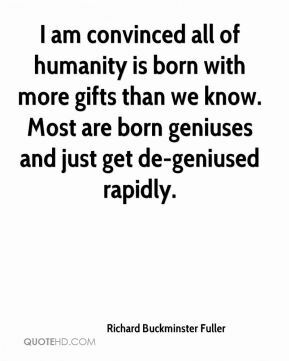 I believe that humanity is master of its own fate... Before we can change direction, we have to question many of the assumptions underlying our current philosophy. 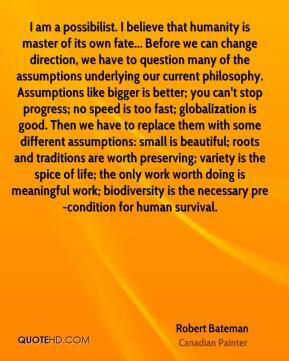 Assumptions like bigger is better; you can't stop progress; no speed is too fast; globalization is good. 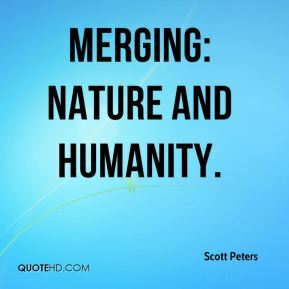 Then we have to replace them with some different assumptions: small is beautiful; roots and traditions are worth preserving; variety is the spice of life; the only work worth doing is meaningful work; biodiversity is the necessary pre-condition for human survival. 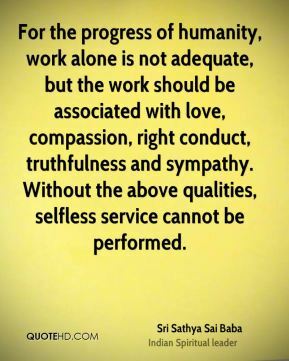 The commemoration deserves the respect and support of all people of good will who cherish the universal love of humanity, ... 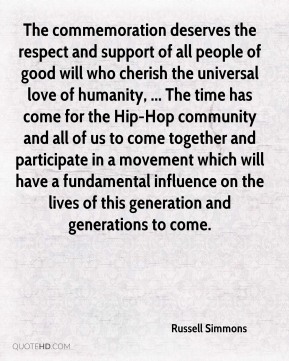 The time has come for the Hip-Hop community and all of us to come together and participate in a movement which will have a fundamental influence on the lives of this generation and generations to come. I just think being a doctor is very appropriate for me. It is a good balance of science and humanity -- very good for me. Also, I've seen how important health is through my activities here. 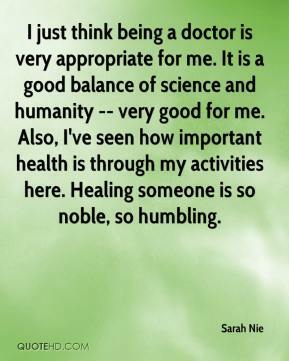 Healing someone is so noble, so humbling. 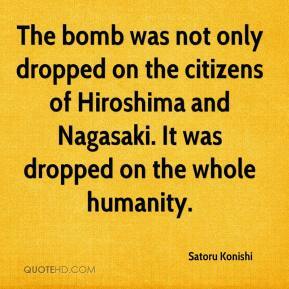 The bomb was not only dropped on the citizens of Hiroshima and Nagasaki. It was dropped on the whole humanity. I tried to get a cross section of humanity really. In this instance, because they have to sing and dance and act, it's kind of like the cross section of the entertainment community. So it's a very diverse group of people. Everybody in the ensemble are stars in my mind. 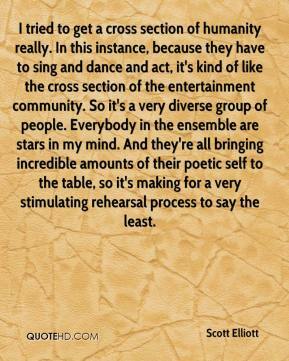 And they're all bringing incredible amounts of their poetic self to the table, so it's making for a very stimulating rehearsal process to say the least. Work! 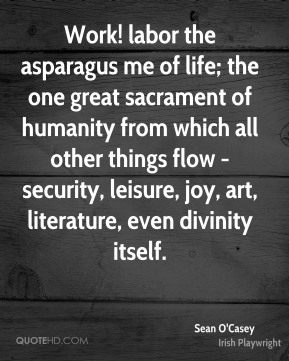 labor the asparagus me of life; the one great sacrament of humanity from which all other things flow - security, leisure, joy, art, literature, even divinity itself. 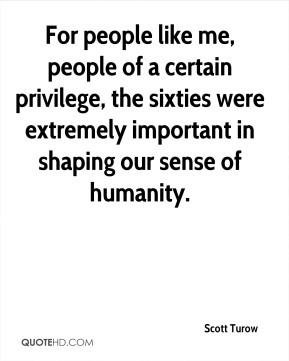 For people like me, people of a certain privilege, the sixties were extremely important in shaping our sense of humanity. This decision can only encourage the criminals of tomorrow. 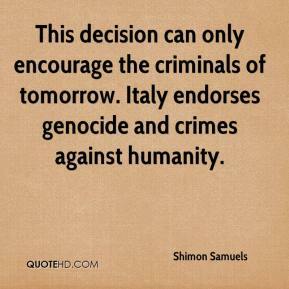 Italy endorses genocide and crimes against humanity.